“Isn’t it hard driving in foreign places?” asked one of our friends. ...foreign to you, that is. If your European and driving in the U. S.
There are things that will be different, but there are also many things that will be familiar. You’ll do just fine with a little preparation. Don’t let this photo worry you.. 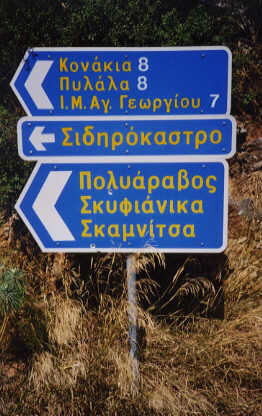 In places where the alphabet is different from what you’re used to, that’s a good thing… because if you were driving in Greece, like here, they'd all be Greek to you otherwise. OK... I couldn’t resist, but you get what I'm saying. You’ll find more of them outside of the U.S. than on U.S, highways, but you will see them here as well. 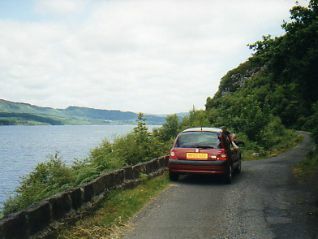 You can take a look at the most common road signs in many guidebooks and on maps. The ones you want to know are not so much these direction signs (though you do want to know where you’re going) but you want to recognize the warning signs for passing and speed limits, things like that. You don't want to be looking in the book to find that the white horizontal slash on a red sign means "Do Not Enter" just as you have driven down the street! For instance… What are the signals to pass or not pass? Watch what the local drivers are doing and take hints from them when you're driving in foreign places. Now in the U.S., that's the old arm signal for turning left. It took us a couple of days to figure out that they weren't turning, just waving us around. 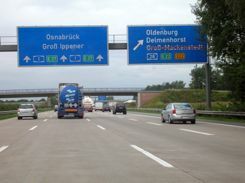 When driving on the freeways/ autobahns/ autostrasses with multiple lanes, don't just cruise along in the fast or left lane. Europeans really do use the faster lanes for passing. Americans should take a lesson here. Driving On The Wrong Side Of The Road? You may be driving on a different side of the road than you're used to. But throughout the world it's pretty evenly split for who drives on the left and who drives on the right. If you're driving on the "wrong" side of the road for you, you'll need to pay even more attention. Drive carefully, and at your own pace. Don't let local drivers press you to drive faster than you're comfortable. If someone flashes their lights at you, pull over, and let them pass. They're used to passing little old ladies on those two lane roads.... just pretend you're a little old lady! Don't let your ego get in the way, they've had more practice. Miles Or Kilometers Driving In Foreign Places? Remember that speed limits and distances may be measured differently. Around the world, most distances are metric, as are speed limits. The U.S. persists in using miles. The average speed limit on U.S. freeways is 65 mph (miles per hour).... that translates to 105 km/h. Speed limits are posted, so that's easy. For distances, use roughly 0.6 mile per kilometer.... or 1.6 kilometer per mile. 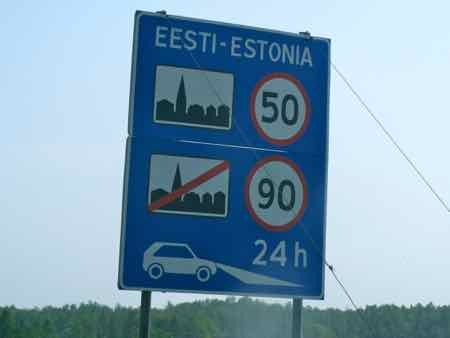 In Europe, the most common speed limit on motorways is about 110 kph (68 mph) and 90 kph (56 mph) on two lane highways. Watch for speed limits as you pass through towns. Toll roads and road fees are a whole category unto themselves. Maps will tell you which roads are free and which are toll roads. They will be great roads, they may be expensive… but they will get you from one area to another in record time. 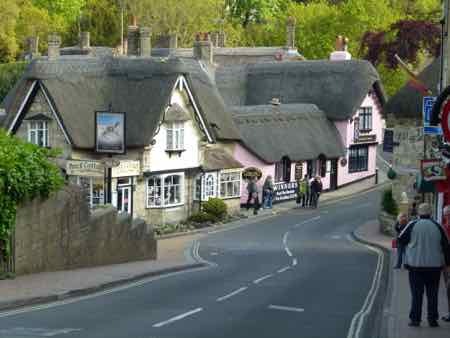 You won’t pass though cute little villages…. that can be good or bad… only you can decide if you want to take the fast or slow road on any given trip. Back lanes all over Europe can be very narrow. Sometimes you just have to pull over… or even back up and let an on-coming car pass. If you don’t know the etiquette where you’re driving… just be the one to give way. Many outback roads in Australia are only one lane wide. If you meet oncoming traffic, you're expected to drive with one wheel on the road and one off road. If you can't do that, simply pull over... but don't expect locals to do that... they'll just drive on through. What About An International Driver’s License for Driving In Foreign Places? We have never been asked for an International Driver's License, even though we have often read you should have one. If we are visiting a country where one may be needed, we get it and carry it. We got ours at a local AAA - American Automobile Association office… they’re good for one year.